When it comes to new technology, nothing’s quite as cutting edge as driverless cars, or autonomous vehicles (AVs). And it’s no surprise that folks are making a lot of fuss over the future of this burgeoning industry. I mean, first off, there’s the fact that the cars are driverless! That’s crazy. It’s science fiction. It’s unbelievable. But it’s happening. And that’s exciting enough. And it’s a little scary, too. There are all sorts of safety issues to overcome. Case in point, a self-driving Uber killed a pedestrian not too long ago. And what’s worse is that the car’s computer had “seen” the person and hadn't altered course. But it’s also exciting. I mean, we’re watching a completely new technology being built. And thanks to advances in other types of connected and autonomous devices, the progress is staggeringly fast. But that’s not all. 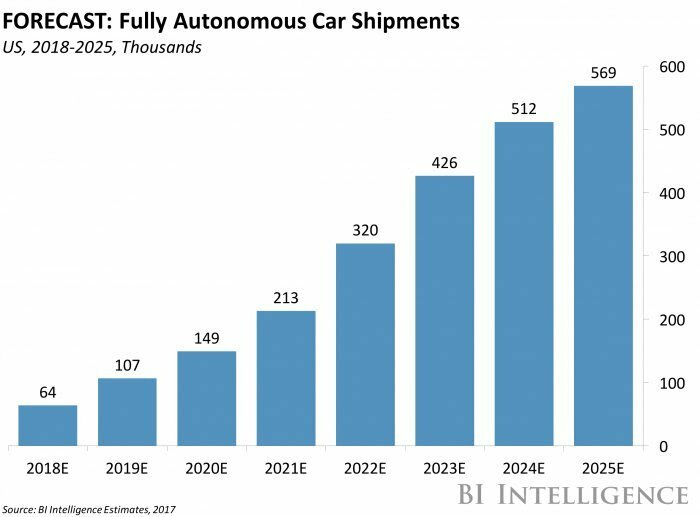 The same report predicts within 10 years of that, the driverless car market will hit $77 billion. That’s some serious cash. And it just keeps growing. But these metrics don't take into account the entire market that will grow around this groundbreaking tech. I’m talking about service, mapping, computing, new business-to-business (B2B) services — everything that goes with vehicles. Boston Consulting is only talking about cars. As in, how much money would be generated from the sales of these AVs. That’s it. When you factor in all the auxiliary industries that will spring up to feed this market, we’re talking about massive piles of cold hard cash. As an example, NVIDIA Corporation (NASDAQ: NVDA) is expecting its total addressable market to be worth $4 billion by 2025. That's only one company. And it's a company that only makes one component of the technology behind driverless cars: the chipsets. That’s pretty big. That’s more than the gross domestic product (GDP) of every country in the world except China and the U.S. Think about that. It's more money than Japan makes in a year. It's more than Germany, more than the U.K., and more than France, India, Italy, Brazil, Canada, Russia, and Korea. That’s a lot of money. And that cash is all up for grabs right now because the industry is still so small and there’s still so long before it reaches maturity. That’s why I’ve been diligently researching the whole industry from top to bottom, factory to driveways, for months. I want to know which companies will be the shining stars of this new industry. I want the next Apple, Netflix, and Amazon. I want Intel before the PC boom. I want Qualcomm before smartphones. And I’m convinced I’ve found just that. Through my research, I’ve pinpointed a handful of companies that have everything it’ll take to become the new leaders in this $7 trillion industry. And I’m going to share each of them with you right here. I’ll explain all the catalysts already in motion. I’ll tell you what each company is doing to make sure it’s at the head of the pack. And I’ll tell you exactly how to invest and what kind of gains you can expect at every stage of your investment. Plus, you’ll get access to our daily Wealth Daily e-letter and our website, which is packed with even more actionable investment advice and trading strategies. It's all for you — all completely free. My first driverless cars stock is an old standard in the automotive industry. You might not know it, but most of the electronics in the cars you drive likely came from this storied British company. From car radios to speakers, driver-assistance software, and the drivetrains themselves, Delphi has a part in just about every car out there. The company recently split in two. Delphi Technologies handles the drivetrain tech and the aftermarket parts and tools. 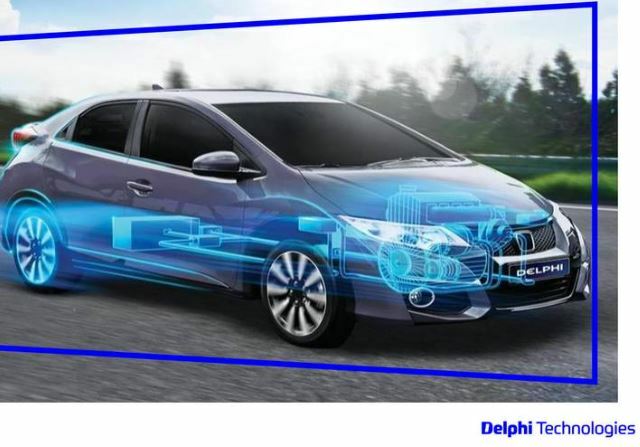 Delphi recently partnered with several other companies, major universities, and the U.S. government to help in improving the efficiency of this new generation of vehicles. Using its patented technology, the cars can do what the company calls “intelligent driving.” What that means is the software makes the car proactive rather than reactive. It allows the car’s onboard computers to interface with other vehicles and connected devices to predict future road conditions. The car will know if the road is hilly or flat, if it’s curvy or straight, and if there’s traffic around the bend or a clear road. And it’ll be able to give the driver — or would that be passenger? — the choice of the most efficient route. Technology like this will help in reducing emissions from AV. And it will likely become a requirement like a muffler and a catalytic converter on an internal combustion engine (ICE). And when it comes to aftermarket parts and service, Delphi has a stranglehold on the industry. It supplies most of the original equipment manufacturer (OEM) parts in cars. So, it also supplies much of the diagnostic equipment used to test and repair the vehicles. That won't change because a computer is driving. If anything, it’s another segment that’ll only keep growing. And with Delphi’s stock trading at around half its 52-week high and with super-low valuations, now is the time to get in on this future titan. It has a market cap of $4.69 billion and annual sales of $4.85 billion. Yeah, you read that right. You can buy $1 of revenue for around $0.97 right now. You pay about $52 a share and get about $54 a share in sales. That’s unheard of. And it won’t last. Plus, the shares trade at about a 16% discount to enterprise value. That means if the company were dismantled and sold, your shares would be worth 16% more than what you'd paid for them. The next driverless cars stock to make my list is an old standard — one of the former kings of Detroit. Yep, believe it or not, Ford Motor Company is already a leader in driverless cars. I know it’s not the first name that you think of when you think about autonomous vehicles. I mean, didn’t the U.S. automakers have to be bailed out to avoid collapse only a decade ago? How could one be an industry leader in something as sophisticated as driverless cars? Well, you’d be partially right to think those things. The U.S. auto industry did get offered a bailout. And two of the three companies took the government’s money. Their CEOs even agreed to receive reduced pay until the loan was repaid. But then Ford CEO Alan Mulally said he was happy with his current salary and his company didn’t really need the help. Ford had been preparing for rough times and although it was hurt by the recession, it wasn’t dying by any means. The other two Detroit powerhouses struggled to survive and pay back massive taxpayer-funded loans. But Ford was able to reinvest in the company. You see, Ford already has a fleet of almost 100 driverless vehicles. And it recently said it’d have Level 4 vehicles — those that can drive themselves within a predetermined area — within the next three years, by 2021. And the company is still making more investments in the technology that will drive this new market. Ford spent $1 billion to buy and build up an artificial intelligence (AI) company called ARGO AI in 2017. The new division will supply the brains behind Ford's AVs. The Argo purchase isn’t the only big spending that Ford’s been up to, though. It recently spent another $700 million on the renovation of its Flat Rock assembly plant to make these new models at scale, in massive quantities. And finally, Ford also recently bought a ride-hailing company, like Uber and Lyft, called Chariot. That should prove a lucrative investment when Ford’s Level 4 AV is ready for sale to companies like Chariot. Ford's management thinks that driverless cars could account for 20% of annual vehicle sales for the entire auto industry by 2030. And it's working around the clock to make sure the company is ready to lead the way and cash in when the industry hits full steam. And finally, No. 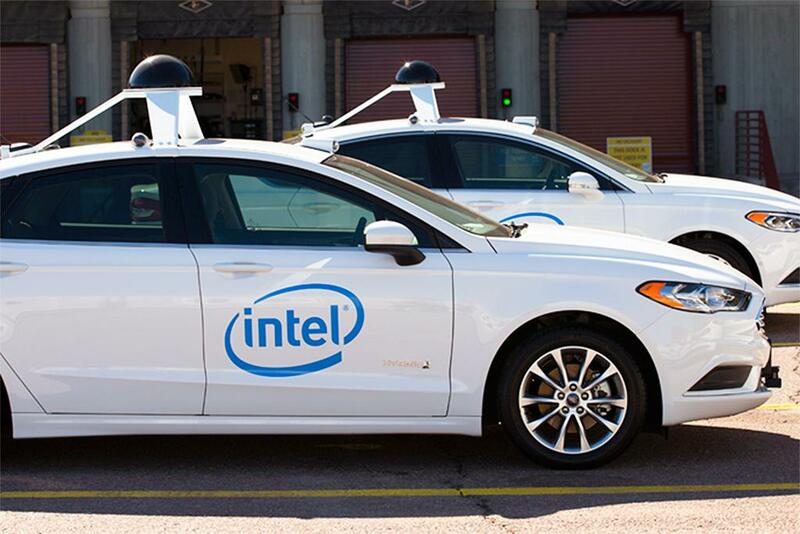 3 on my list of the top driverless car investments is an old hand in the chip-making business: Intel. Intel has been a major player in the PC and smartphone chip market since the beginning. And it's recently been looking for an on-ramp into the autonomous vehicle industry. And in 2016, it found just that. Intel shelled out a hefty $15.7 billion to scoop up Mobileye and its massive share of the advanced driver-assistance systems (ADAS) market. ADAS is the real backbone of AV tech. It includes things like automatic braking and lane departure systems. As of 2017, Mobileye held a 60% share of the entire market. And that share has grown since to around 70%. The Mobileye deal should position Intel in the perfect spot to sell driverless car technology to auto manufacturers. But that’s not the only inroad that Intel’s making into the AV industry. Intel is an expert and market leader in chip-making. These are the processors that give your phone, tablet, and PC the memory and computing power to handle the daily rigors that you put them through. And Intel makes some of the best chips on the market. That’s why you’ll find their products in so many devices. So, it’s only natural that Intel is working overtime to develop the kinds of processor chips that will allow driverless vehicles’ computing systems to handle the massive amount of data necessary for them to work. The company already has functional chips and a contract with Google’s self-driving car company, Waymo. And because its chips are already being used for things like sensor processing, general computing, and connectivity, Intel’s chips have way more street cred in the AV world. The company has also partnered with a few smaller operations to release what it's calling an off-the-shelf autonomous driving platform by 2019. The plan is for automakers to be able to plug it into their vehicles to give them Level 4 autonomy. A plug-and-play platform for AVs could be huge because it would negate the need for Intel to personalize systems to individual manufacturer's specifications. That's one platform to rule them all and us reaping all the rewards. As Pat Morita taught us in The Karate Kid, patience is a virtue. And it’s a necessity. And that's especially true when you’re investing in an industry that’s still in its infancy. So, don’t expect any driverless car companies to explode within the next year or two. You’re positioning yourself for the long run here. Like the companies that made my list, you’re planning ahead — very far ahead. The most aggressive timetable in the industry belongs to Tesla. That company says it’ll have a vehicle that can drive itself from Los Angeles to New York City sometime this year. That might happen or it might be another one of Tesla CEO Elon Musk’s empty promises. Either way, don’t expect Tesla to start offering AVs to the masses anytime soon. Then there’s Ford, our No. 2 stock. It’s made big investments in driverless tech. And it’s hoping to have a Level 4 AV on the road by 2021, which is only a few years away. In case you were wondering, a Level 4 vehicle has neither a gas pedal nor a steering wheel and can only operate in a predefined area. But again, that doesn’t mean you’ll be able to walk into a dealership to buy yourself one of those newfangled self-driving vehicles. The company will first make them for ride-sharing fleets. We'll come way later. Level 4 geo-fenced self-driving vehicles that can only be operated by an Automated Driving System will probably begin around 2021. But, retail sales to consumers of so-called Level 5 vehicles that can operate anywhere a person can drive a conventional vehicle today is unlikely to happen until around 2025 or after... Ubiquity is not projected to occur for at least four decades largely due to the fact that over 260 million light duty vehicles are registered in the U.S. So, we’re talking maybe 2045 before you can go buy an AV and let it take you home. But getting in now ensures that we’ll be around to catch all the growth that this new industry has to offer. But that doesn’t mean you won’t see any gains at all for decades. Quite the contrary, I expect we’ll start seeing some slow growth this year. And that should continue into the midterm until it finally accelerates and goes parabolic as the rubber hits the road. Be patient. Keep buying on dips. Keep reading Wealth Daily. And remember, you’re in it for the long haul.